Yesterday was the inaugural match at Erie County Conservation League in Milan, Ohio. We had 23 shooters and everything went extremely well. I fired a personal best 2525 which won the Sharpshooter group (Expert Card coming soon!) and shot an 862 in rimfire which was the second best score overall. It really felt like home field advantage for me as this is my home range and is only 15 minutes away from my home. After every match I always end up sitting and looking at my score cards (I take pics of them) and look at my strengths and weaknesses. This leads me to figuring up what I need to make Master which is my goal. My .22 pistol is perfect right now, I really feel the gun and the bullet are what they need to be and where the improvement lies is with the nut behind the trigger. Range Officer. The gun is very capable of shooting clean sustained fire scores were it not for me. During one of the time fire stages I could clearly see the x-ring being blown away. On my 10th shot I panicked and threw it in the 8 ring ending up with a 98-7x. Knowing the gun is capable of shooting Master sustained fire scores leaves me wondering about slow fire. The highest slow fire string I have ever shot with it has been a 95 and that was indoors. That is a minimum Master score. I do not have any way of ransom resting it. I am not entirely sure I can make Master without buying a new gun. Here is the kicker. I think most any 1911 can shoot 95+ sustained fire scores. The slow fire CF and .45 stages make up 22% of a 2700 match. I would be spending 1500-2000 just to score high enough in 22% of a match in order to make Master. Of course if I shot a 600 in sustained fire, I would only have to shoot 85 in each slow fire string to make 855 So having a custom built gun will allow the shooter to not have to shoot a perfect sustained fire stage. Thanks for reading and look forward to any comments. Tomorrow I will go back to worrying about my diet and exercise regimen and dry fire practice but for tonight I will keep crunching the numbers on my scorecards and my wallet. I don't think you need a new gun. You just need to improve your SF a little. How does the gun shoot your long line ammo from a rest? If you shoot solid master scores with the .22 and your master card is your goal you can shoot in 1800s to make sure your 360 shot average stays up in the master range. Good shootin! I have the opposite problem. I shoot 90+ slow fire strings with my stock springfield, but the shooter botches the sustained fire strings. Usually low 90's due to bonehead mistakes. You need to be confident in your equipment and be confident in yourself. You have shot a 95 SF, so you know you and the gun are capable of it. If you can shoot 90's in SF you only need to shoot 98's in sustained fire. You have done both of these, you don't need a new gun you need to trust your current gun! I would say your 45 is near perfect to make master, now you just need to tweak a few things. First i would sand bag your load, if it cant hold the 10 ring at 50 yards then it needs some work. Another thing that tightens groups is weighing your 50 yd bullets and sorting into groups that dont vary more than .9 gn. Then check your powder measure for consistent drops, if it varies by more than .1gn then you need to fix it so it does. Once all this is good and you see a 10 ring groups off the rest , its up to you after that. Congrats on the match, its obvious you have the talent to reach master soon. If you have not already done it, I think you should consider, since you are trying to raise your long line scores, and that is to work your load up to find what shoots best in YOUR pistol at 50 yards. Even over sand bags you should be able to discern that load B shoots a tighter group than load A or C. You may find that what you are using hits the sweet spot for your pistol, maybe not. I put off testing loads for several years after I started shooting Bullseye. When I finally did the work I was surprised to find what a difference in groups size could be made by a small change in powder charge. I found what shot the smallest 50 yd groups for my pistol and stuck with it. Having done the testing allows me to be very confident that the bullet will consistently go right where I point the pistol, for better or worse! sixftunda wrote: After every match I always end up sitting and looking at my score cards (I take pics of them) and look at my strengths and weaknesses. You're looking at results, when you should be looking at process and performance. This is so true. You should be able to know everything about the shot by what you felt, and saw in the sights. Talk to Terry Lapchynski about the gun. He's local and capable. He may be able to tighten your lockup and help the gun. The advice above from John is excellent. Trigger time is also important. You are on an excellent learning curve. If your gun/load will regularly shoot 95's you will soon be a Master and on track for 2600. You guys are right, but it is a lot easier to analyze the data in bulk. It takes mere moments to look at the score cards instead of trying to remember all 270 individual shots. While shooting, concentrate on individual shots, and the strings will be fine. Tracking scores after the match can uncover trends and build confidence. Just try not to track scores during the match. Are you trying to call your SF shots? If so, are your shots on call? If a large number of your shots aren't on call, then it may be time to look at your gun/ ammo quality. A lot of this game is in the head. If you have confidence in your equipment, it helps to focus on the "loose nut behind the trigger". I do have my shot process written out and it is constantly a work in process. With SF the biggest issue for me is making myself abort the process when I need to instead of trying to force the shot. In sustained fire I am currently working on the best time to raise the gun during the commands and getting the first shot off. The load I am currently using (160 gr LSWC, 5.0 gr. Tite Group) is very accurate on the short line, not quite shooting to call on SF but there is a reason for that. When I shoot Bullseye through it at any load I have used, the chamber builds up carbon and crud at such an alarming rate that I can not get the gun to function through a 2700. I had posted a picture of it on the mailing list. The consensus seemed to be that the chamber was a little too big and/or the casing (once fired WCC match) was not expanding enough to keep crud from coming back into the chamber. Tite Group was the only other powder I had at the time. So besides shooting a good score, the other goal at this match was getting the gun to function through a whole match, which it did. I have since gotten a hold of some American Select, my closest store is still out of N310 and WST. The Tite Group shot so good at the short line that I will not be changing it. Just need to work up a clean accurate load for the long line. I really appreciate everyone's advice! 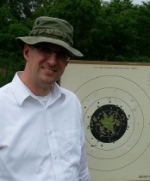 In terms of accuracy, especially at 50 yds, the most critical component is the bullet. I would start there and likely go to a good 185 or 200. Find a bullet that shoots accurately in your gun with a known good powder like bullseye. Then you can use that bullet and play around with powders and charge weight to get something you like. If you don't start with a bullet capable of tight accuracy at 50 yds, you will waste a lot of time and not get to the destination you desire. Well, I can honestly say that yes, the gun is capable of master scores. I shot a 2564 at the Governor's Trophy match yesterday at Canton McKinley. Shot my first clean timed fire and then shot two more clean timed fire stages!! With the mistakes I know I made on the long line and in rapid fire, I would have definitely shot a master score. Great to hear, So did you change your load for the long line or just improve your delivery? This time around I weighed and separated my bullets by weight. I also sat down and used a Lee balance scale and checked the powder weights for my Dillon 550 compared to an old RCBS powder measure I had. The RCBS gave a more consistent powder charge, so for long line rounds only I took the powder/flare setup off the Dillon and put on a Redding flare die and then removed each casing from the press after it was flared, added powder with the RCBS powder measure, then put it back in the press and advanced it to the next station. I used 4.4 grs. of Bullseye with a 160 gr. Quality Cast. The other thing I did was bring a Bore Snake to the match and run it through between short line and long line and anywhere else I had time. For the short line I still separated the bullets by weight but used the Dillon powder/flare setup. For short line I used 5.0 grs of Tite Group. Absolutely! My long line scores were more consistent that what I have shot so far this year (even compared to indoor matches). I shot three clean timed fire scores. THREE!! I have never shot a clean anything with my 1911 before yesterday. One odd thing I noticed yesterday that I had never seen before: on the long line I found pieces of the lube from the bullets on the target. It must have came off the bullet in flight before the bullet went through the target. Weird. Well your attention to detail has paid off, do you think the 5 gr of tightgroup has more or less recoil than the 4.4 be, we shoot the same bullets at 4.5 of be short and long line. I have not noticed a difference in recoil but really have not paid specific attention to it. One noticeable difference is that I only have to adjust two clicks between long and short line.